Availability: July 15, 2014, but digital issues are being released monthly until then. Summary: In the comics boom of the 1940s, a legend was born: the Green Turtle. He solved crimes and fought injustice just like the other comics characters. But this mysterious masked crusader was hiding something more than your run-of-the-mill secret identity… The Green Turtle was the first Asian American super hero. Review: After reading an interview with the creators of The Shadow Hero, I couldn’t wait to get it into my hands. Fortunately, it turned up on Netgalley so I only waited two months. The Shadow Hero was worth every bit of that time though. Yang and Liew have taken a super hero from the past and built a backstory for him that combined Chinese American culture, a tiny taste of the supernatural, and a rather colorful mother. She is not the most nurturing person, but she had other strengths. She certainly provided comic relief. I have seen women keep money, keys or other random things down their shirts, but this was my first experience with storage of pork buns in that particular location. We get to know her early in the story because Yang starts the backstory way back – before the boy who would become The Green Turtle is even born. 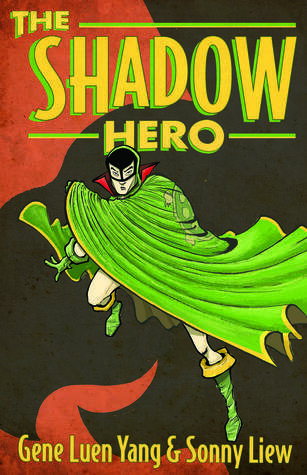 What I love is that The Shadow Hero has such a nice balance of action, adventure, humor, seriousness, and flirtation. There are action sequences in each issue and several doses of comedy. I didn’t want it to end. I have not been a reader of many superhero comics. That just never was my genre of choice, but Yang and Liew are winning me over. This comic was extremely entertaining. Like Yang’s previous work, there are some potentially offensive racial slurs, but they make sense for the time and place. The mother is also quite exaggerated, but she grew on me in spite of her obsession and dangerous single-mindedness. As for the illustrations, Liew wowed me. I am relatively new to the comic/graphic novel scene, but it seemed that Liew used a color palette pointing to an earlier time. That would make sense with this resurrection of a superhero from the 1940s, but it could just be his style. There were many shades of brown and most colors appeared a bit muted especially in the beginning when they were setting the stage. It made me feel like I had stepped back into time. The artwork was also fantastic. The reason I didn’t read a lot of comics in the past was that pictures slow me down. I am a plot fan and want to know what happens next. Right now. I zip through the words and tend to ignore illustrations. These pictures required me to take my time and pay attention, but I didn’t mind in the least. Liew added so much life and personality to each of the characters and the surroundings were rich in detail. To see for yourself, there is an excerpt available here. Gene Luen Yang also provides some background on the creation of the book here which includes the text, rough sketches, and final images of the first few pages. Sonny Liew also gives some background information on his blog. Finally, as an added bonus, the hardcopy includes a section at the end that provides facts and rumors about the original comic that was created back in the 1940s. It also includes pages from the original. I have to admit, I enjoyed the updated version significantly more, but I appreciated the history involved. To hear about this collaboration, watch this video. Recommendation: Buy it now or at least as soon as it is possible. The first issue is available now digitally and the second issue will be released on March 18th. The digital copies look amazing so I would recommend them as they are released. Otherwise, get the hardcopy in July. I will be singing the praises of The Shadow Hero for quite some time and I hope that this is not the last we see of the Green Turtle.